The aim of this year’s InterLab study was to establish a GFP measurement protocol based on engineering principles that anyone with a plate reader could use in their lab. This study was an interesting and valuable experience that prompted the team to use new equipment which would not have been used in establishing our personal project alone. In the beginning, the preparation of competent cells and their transformation according to the protocol seemed to go well but after the required incubation time, no colonies were grown, which lead to another attempt. With greater precision and care, the transformations succeeded. After the transformations we followed the plate reader protocol supplied by the iGEM HQ using LB broth as the growth medium. Afterwards, we generated a FITC standard curve to calibrate the plate reader and then measured both the fluorescence and absorbance of our samples in 2-hour intervals over a 6-hour period. Figure 1. 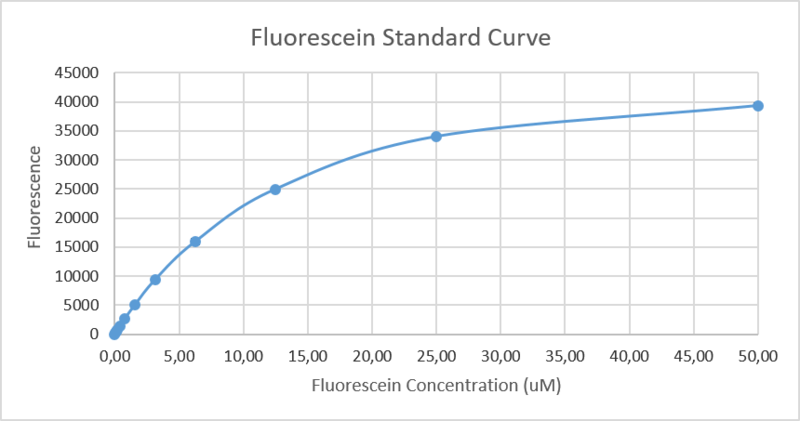 A standard curve generated by measuring the flourescence of serial dilution of FITC stock (uM). There is a somewhat polynomial trenf for the increase of flourescence as [FITC] increase. Figure 2. 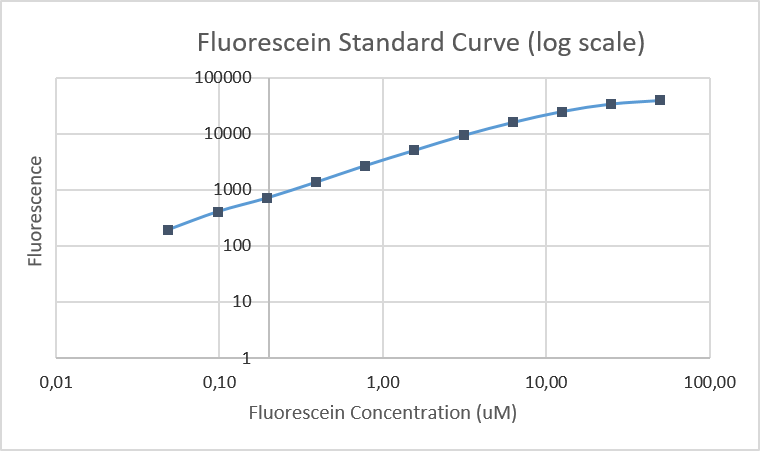 A standard curve generated by measuring the flourescence of serial dilutions of FITC stock (uM) displayed in a log scale to demonstrate a linear relationship. The standard curve slopes showed a somewhat polynomial shape (Figure 1), although they were supposed to have a 1:1 slope. This could have been due to a consistent pipetting error. The straight-line log graph without a 1:1 slope could justify this hypothesis (Figure 2). Furthermore, the detector could have been oversaturated, because low concentrations were linear, but at high concentrations it either saturated or fell. Based on the part description data from the official iGEM wiki InterLab and part sections: the first three test devices labelled (TD1; TD2; TD3) accordingly differ in their promoter strength with the first one being the strongest, as do the 4th 5th and 6th devices, following the same pattern with the same promoter variability. However, the final three differ in their RBS strength. The first three devices have the B0034 RBS, while the final three have the J364100 RBS. Lastly, the positive control (PC) also contains another version of the RBS labelled B0032. The positive and negative controls did not vary in any significant manner (Figure 3), indicating a methodical error, because the positive control should have shown the largest level of fluorescence due to the strongest RBS and a relatively strong promoter, based on the iGEM wiki data. Figure 3. The flourescence of the six test devices both positive and negative controls over 2 colonies were transformed into E. Coli and inoculated in LB broth was measured every second hour for a 6-hour period. There is a sharp increase of flourescence after 4th hour indicating cell maturity for most of the samples. The first three test devices follow the predicted trend (Figure 3). Since the RBS does not differ and the variability is in the promoter regions, the strongest promoter was given to TD 1, which showed the overall strongest fluorescence over the course of 6 hours. The 2nd and 3rd test devices followed a decreasing trend in fluorescence. Furthermore, when comparing the values of TD1 and TD4, which both have the same promoter strength, but differ in RBS sequence, we showed that the B0034 RBS was significantly stronger than the J364100, indicated by the 6th hour values for TD1 ranging from 3900 to 5020 (Au) between both colonies and the values for TD4 ranging only from 1105 to 1397 (Au). Figure 4. The absorbance of the six test devices and both positive and negative controls for 2 colonies inoculated in LB broth was measured every 2 hours for a 6-hour period. the overall trend of an increase over time persists in all samples for both colonies. By analyzing the Abs600 absorbance values (Figure 4) we should expect a somewhat opposite trend. The negative control shows the highest values of absorbance since there are no genes coding for the GFP protein and the metabolic load is the smallest, when comparing to all the other devices, hence the highest overall absorbance. The devices containing the strongest RBS and promoter sequences should display the lowest levels of absorbance as the cells commit a vast amount of resources to the synthesis of the GFP protein, hence an overall smaller population size and rate of growth. This is displayed in our data as the test devices such as TD6 and TD5 show some of the highest values for absorbance, and the test devices with the strongest RBS and promoter sequences such as TD4 and TD1 present the smallest values. However, the results seem to slightly disagree with this prediction as the TD4 shows the lowest absorption values and the TD1 appears slightly above. A possible explanation for this could be that during the preparation of the samples and the growth phases, environmental effects could have played a role in the differentiation of the data after hour 2 during the exponential phase.